MPulse customers know when they need help or have a question, the answer is just a phone call away. Ben Wilberding, MPulse support services engineer and our MPloyee of the Quarter, is one of the folks on the other end of that line, helping our customers when they need it most. After joining MPulse in September 2016, Ben quickly distinguished himself among our tight-knit support service team, says Randall Brous, MPulse CTO. Ben and his support service coworkers never know what’s on the other end of the phone line. Those cases can be as simple as helping a customer change a password, as intricate as a complete software installation, and everything in between. Depending on the complexity, Ben typically completes 5 to 15 cases per day. MPulse customers may be experienced IT people, or completely unfamiliar with all but the basics of computer technology. Ben came to Oregon from Madison, Wisconsin, with his wife of 5 years, Janet, to work in software support. His position at MPulse uses those skills, as well as his background in information technology. Ben and Janet soon established roots here, along with other members of Ben’s extended family. They have two daughters, Hayden and Aerith. 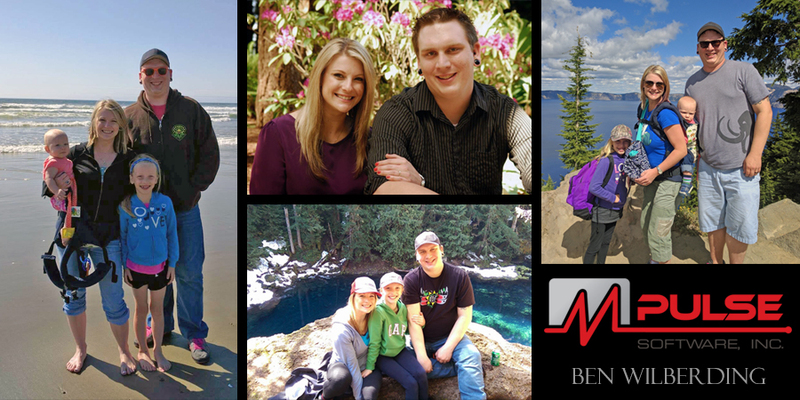 When he’s not killing cases at MPulse, Ben likes to hike and explore; watch his kids experience new things; play video games, guitars, and computers; and spend time with his family. MPulse’s MPloyee of the Quarter honors our employees who are making a positive impact in the company by inspiring others and building engaging, long-lasting relationships with our customers.